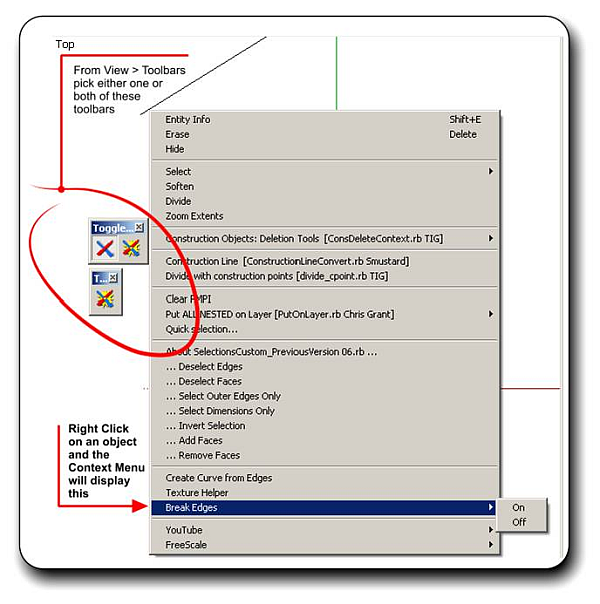 usage ToggleBreakEdges adds a toolbar, context-click (right-click) menu item, and Plugins menu item access to turn on and off the new Auto Break Edges feature in SketchUp 7. Note that on Mac, this change is at the application level, and thus affects all open files. On both Mac and PC, turning the Auto Break Edges functionality off, drawing, and then turning it back on may temporarily slow down SketchUp or cause your computer to appear to hang (temporarily) as SketchUp tries to recalculate intersecting geometry. This same condition may also result for SketchUp users who have Auto Break Edges turned on and open a file that was drawn and saved with Auto Break Edges turned off.